HIDDEN IN PLAIN SIGHT: THE HERMANN KLEIN PHONO-VOCAL METHOD Hermann Klein (introduction by Daniel James Shigo). New York. VoiceTalk Publications, 2013. 104 pp. This remarkable book, with an introduction by New York voice teacher Daniel James Shigo, makes available for general use and study the precepts of the vocal method developed and perfected by Manuel Garcia, Jr. (1805-1906), son of a tenor who had sung Don Ottavio during Mozart’s lifetime and created the role of Almaviva in Rossini’s Il barbiere di Siviglia. 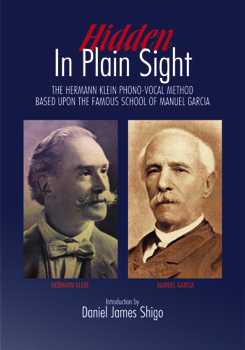 The book, written by one of Garcia’s more famous pupils, the music critic and voice teacher Herman Klein (1856-1934), was part of the “Phono-Vocal Method” that Klein initiated in 1906 with the fledgling Columbia Graphophone Company, recording examples in the four major voice types (soprano, alto, tenor, and bass). Shigo tells the sad tale of the records, most of them destroyed in warehouse fires that Columbia suffered (I’m guessing they didn’t believe in either fire alarms or sprinkler systems), and the book, which he sought in vain for years until he realized that before World War I Klein spelled his first name with two n’s, only one afterwards. Manuel Garcia Sr., trained in the old Classic Italian method, taught each of his children to sing: his son Manuel Jr., a baritone who lost his voice by age 30; his eldest daughter Maria, who became a soprano and a legend (though she died at age 28); and his younger daughter Pauline, who also became a legend, though she lost her voice by the age of 39. Frustrated by his own experience as well as the difficulties his sister Maria had (her voice was always described as uneven in quality and on the verge of collapse), the younger Garcia devised a method based on the Classic Italian yet in some ways radically different from it. John Stratton, in his article “Operatic Singing Style and the Gramophone,” claimed that although Italian-trained, Garcia Jr. formulated some of his method by reverting to his Spanish heritage and earliest vocal studies, but presented no hard evidence for this. Spanish traditions of vocal art were quite different from the Italian. Since the time of the Renaissance, cultivated singing had been a falsettists’ art; in the late 16th century, Spanish falsettists were in great demand throughout Europe. Even in Italy, until Spain lost its influence there in the early 17th century, they were preferred to castrated altos in church music. These falsettists, however, should not be confused with the type of trained falsetto used today by most countertenors; their art was a very special one, which produced a quite different sound. Angus Heriot, in comparing these singers to the castrati, made mention of their unique qualities: “Ordinarily, as has been said, a normal man singing falsetto isn’t able to exceed the alto range; but the Spaniards had evidently found some way of developing the voice even higher, by an unknown method that did not involve castration, to produce a male falsetto soprano.” The mere fact that they were often confused for eunuchs attests to the fact that they imitated (or, in the opinion of some, surpassed) the tone quality of the castrati successfully. Stratton’s error—which I myself believed for years (why shouldn’t I? he was an established and respected voice teacher and baritone)—was in connecting the art of the Spanish falsettists to those turn-of-the-20th-century singers who had minimal or no vibrato (e.g., Pol Plançon, Mabel Garrison, Louise Homer, Lilli Lehmann, Florence Easton, Paul Reimers, and many others, none of whom studied with Garcia or any of this who had in turn studied with him). In point of fact, the real Garcia-trained singers, including those taught by his sons and pupils such as Anna Schoen-René (1864-1942), did indeed have noticeable but very well-controlled vibratos (Margaret Harshaw, Shigo’s teacher, was a famous example), controlled due to his method’s stress on mask resonance. This did not include the nose itself (on p. 19, Klein specifically warns pupils to avoid “Excessive use of the nasal and other resonators”), but it did include upper nasal cavities, which is not the same thing. There is also a spot right between the eyes referred to as “aperto ma coperto,” or “in the dome of the head,” where high notes could be placed for a truly ringing tone. If one listens to the better Spanish-trained singers from the earliest years of the phonograph, even those who did not study with Garcia such as mezzo-soprano Ramona Galan, soprano Maria Galvany (leaving aside her often bizarre musical styling), or tenor Francesco Viñas (there are examples of all three on YouTube), we can gain some measure of his sound model. These voices had a bright, steady vibrato along with a focused tone and a peculiarly ringing quality in the upper range that resembled the best Italians but was rather more “heady.” Perhaps a good example of the way these Spanish falsettists may have sounded back in the old days are the 1903-06 recordings of Richard Jose (1862-1941), a Cornwall-born singer whose natural voice never dropped below the mezzo-soprano range when he reached puberty. As a result, he billed himself as a countertenor, singing popular Victorian-era ballads of the late 19th century in a pure, ringing voice that was secure up to the D above high C (listen especially to “I Cannot Sing the Old Songs”). Yet it was quite a while before the Garcia method was adopted wholeheartedly as an alternative to or substitute for the Classic Italian; such is the way of singers that they try to patch up whatever method they have or are familiar with. Having lost his own voice before he was 30, Garcia wanted to carefully investigate the workings of the voice, i.e. the physiology of the vocal organs. In order to do so he invented the device known as the laryngoscope, with which it is possible to observe the vocal cords and related muscles in action. Thus Manuel Garcia Jr. was the first teacher whose method was “scientific;” that is, scientific insofar as his detailed study of physiology went. The important difference between him and modern teachers who use “scientific” means is that he built his principles around his father’s system; his interest was in having singers produce the most beautiful sounds, not the most “scientifically correct.” His method, as Klein and Frank Herbert Tubbs, another Garcia pupil, have said, stressed mask resonance. Shigo quotes Tubbs on pp. xi-xii of his book as saying that he was never quite sure of Garcia “became convinced that respiration was not important (emphasis mine) does not appear. But he ignored…what was fundamental in Lamperti’s work [and] established a method with new basic principles (italics again mine).” As a result, his pupils possessed voices with greater tonal purity without sacrificing the expressiveness of the best Italian-trained singers. Their voices were so evenly produced that every note from top to bottom was of uniform quality. Their intonation was perfect, their technique nearly so. Yes, they occasionally hit klunkers—they wouldn’t have been human if they didn’t. Their singing wasn’t always flawless. Yet the ideal of flawless production was always in the back of their minds and among their top priorities when singing. One area where the Garcia method found unqualified success was in the music of Wagner. An explanation for this unusual circumstance is that, of all the major operatic composers who arose to prominence after 1845, Wagner alone wrote music using the full range of the voice and in fact setting his tessitura, or “average” range of the music, in the middle rather than in the upper third of the voice. His music rises to high B-flats, Bs and Cs only on occasion, and latter at full voice very seldom. In addition, Wagner alone seemed to understand the amount of work each part of the voice could sustain in the course of a complete role. But since the Garcia method was built around mask resonance and not dependent on heavy breath pressure, it also helped facilitate singing long roles which some Classic Italian-trained singers might find tiring and wearing. Of course, that depended on the individual singer. Certainly the Italian-trained baritone Mattia Battistini, who also happened to be greatly admired by Wagner, adapted the Italian method to produce sounds in his voice quite similar to those of the Garcia singers, his lessened vibrato evidently the application of some of Garcia’s principles in the production of his high range. Yet Battistini was an anomaly among Italian singers of his time, rejecting the use of the diaphragm in favor of intercostal breathing. Most voice teachers reject this as unnatural, yet it was also used by the New York-based teacher William Pierce Herman who taught it to his pupils, the most famous of whom was soprano Roberta Peters. Which brings us to the dissemination of this method. Garcia himself wrote two books on singing, but both were rather vague in their instruction. The young Hermann Klein, was an assiduous learner but only developed a weak tenor voice; nonetheless, Garcia thought so highly of him that he encouraged him to become a music critic and, later a voice teacher himself. Klein came to New York in 1901 seeking to expand his reputation after 14 years on the faculty of the Guildhall School of Music, armed with a letter of recommendation from Garcia Jr. that he promptly had published in The Musical Courier. Having a bit of a chip on his shoulder, asserting himself as “the” authority on good singing, he rubbed other New York teachers the wrong way. Nevertheless, he persuaded Columbia to let him make a series of recordings demonstrating the correct way to sing, in connection with which he wrote this book. In its 84 pages, Klein covers in exacting detail the aims of the method as well as exercises designed to achieve their ends. What I found particularly interesting was that Klein made it clear in the Preface that he had always refused to write a book on singing previously because he found it very hard to convey effective instruction solely through the printed page, but that now that he was able to record “proper” voice placement and singing, he “found real pleasure” in “formulating this Phono-Vocal Method for self-training and study.” This brings us back round to the records made to supplement this book. Most of them were lost through the ineptitude and bad luck of the Columbia company, which had them accidentally destroyed—not once, but twice!—by warehouse fires. All that seem to have survived are a handful of soprano discs, housed and generally unavailable for public listening at the Yale Music Library (donated after his death by Lawrence Witten, a vocal record collector who never did believe in sharing his treasures with the world), and a few discs by contralto Janet Spencer, which a generous collector leant to Shigo and which he is going to make available for sampling on his website. Another curiosity is that in Klein’s later (1923) booklet on The Technique of the Bel Canto, written when he was back in England and focusing primarily on the correct style and interpretation of Mozart, his list of basic principles—though numbering eight, the same as in the Phono-Vocal Method book—are slightly different. In 1909, these basic principles are given as Breathing, Adjustment and Attack, Vowel Formation, Resonance, Management of Registers, Enunciation, Phrasing, and Tone-Color and Expression. In 1923 Breathing, Resonance, and Vowel Formation are still considered paramount, but the others now include Sostenuto (Sustained Tone), Legato (Slow Scale, Registers), Portamento, Messa di voce, and Agility (Coloratura, or Ornaments). Of course, within the many and varied exercises in the book all of those other topics are covered, but I still found the differences interesting. Whereas Garcia Jr. tended to be rather vague in print about his singing method, preferring to show the pupil how it was done in his studio, Klein is meticulous in his prefatory descriptions on preparing the tone, the actions of the jaw, mouth, tongue, hard and soft palate, the singing position, starting the tone, attack, regulating strength or volume, and “listening for the true pitch.” And that is just under “Adjustment and Attack”; each of the other seven topics receive equally detailed treatment. Part 2 of the book gets into the kitchen of the singer’s mechanism with detailed exercises. An important warning appears on page 38 of his book: “Do not be discouraged if you do not immediately succeed. Above all, do not seek to build your perfect ‘bridge’ by the slightest use of force (italics mine). If you find the “ends” will not meet satisfactorily, always choose the upper one to work down with (italics his).” Most important, however, is his constant admonition that although this is a relatively short book it is not a relatively shortcut to success, that each page of exercises is to be practiced over and over and over again until they are perfect before moving on to the one following. In essence, the Klein/Garcia method is one designed to create a voice that is not only beautiful and lasts long but which is also expressive, and that expressivity comes from the continual variance of breath pressure that changes the color of the voice. In this respect, Klein and Garcia are almost entirely at odds with modern singers, most of whom are encouraged to produce an “all purpose” vocal tone that is for the most part uninflected so that directors can mold them to “their” vision of the opera. In other words, the creation of a character through vocal means—coloration, changing timbre and vowel tone, slowly and carefully building up flawless runs and divisions, triplets and slurred notes, arpeggios, legato, and staccato—is designed to create a perfectly-controlled voice that is as much under the owner’s control as a piano, violin, or flute is to a master performer on those instruments. This is now considered old-fashioned; most modern listeners want shouting and screaming in their opera singers, because that is what they hear in their pop music. I have talked to several young people who enjoy classical music, and although they can take a pure tone in a clarinetist, horn player, or cellist, they want their singers to sound rough and raw, because to them such singing is “honest.” It’s an aesthetic that goes back to the emergence in pop culture of such singers as Joe Cocker, Janis Joplin, and Bruce Springsteen, followed by such classical singers as Peter Hoffmann, a former rock singer who turned to Wagner. I found Klein’s advice on how to express one’s self in an operatic role (p. 26) perfectly true and apt even in our modern age: Learn the piece thoroughly, “study and absorb it textually, word for word, note for note; search for its true meaning, obey every indication set down by the composer (italics mine), make every ‘point’ without any obvious striving after effect. Finally, after having, as it were, ‘lived’ in imagination whatever experience the dramatic idea or situation may portray, the interpreter can give to the audience the concentrated art which simulates that experience in every fitting detail, doing so with all the essential self-abandonment and power, yet without loss or diminution of vocal control.” Translation: You don’t need to hammer home allegories in the plot with naked bodies, Nazi uniforms, dead rabbits, or a chorus that walks around the stage shuckin’ and jivin’. Just deliver the drama through your acting and voice. Stratton, John, “Operatic Singing Style and the Gramophone,” The Journal of the British Institute of Recorded Sound (April-July 1966). Heriot, Angus. The Castrati in Opera (London, 1956), pp. 10-11. Since this review was published in March (it is no longer available at Fanfare's website except to subscribers), the book's list price has risen somewhat (now inexpensive instead of ridiculously cheap), and the Janet Spencer recordings were made available. Both the book and recordings can be found in the right hand column of VoiceTalk.